The FileTime Reports feature provides your firm powerful tools for generating reports on virtually any aspect of your firm's eFiling and/or eService activities. This can be for billing purposes, for case reviews, etc. Only firm eFiling administrators have access to the Reports feature. Login at www.filetime.com and click the Admin button. If you do not see the Admin button you need to have your firm eFiling administrator assign the Admin role to you so you have access to this feature. Click the Reports button on the sub-navigation bar. The overview report provides you a quick overview of eFiling and/or eService activities matching your selection criteria. If you require only the total fees for a submission, for instance, you may find that this concise report provides all the information you need for billing purposes. You can export the report in PDF or Microsoft Excel format. View a sample of the report here. 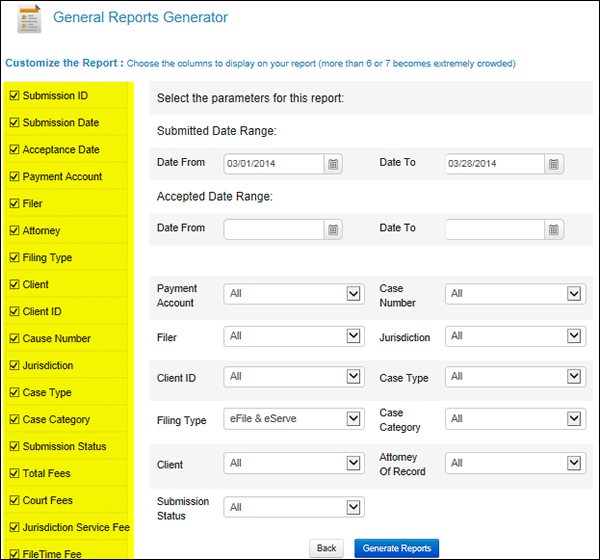 Use this report to bill each case by the submission rather than by the individual filing. A submission may consist of multiple filings for a single case so billing by the submission may be more efficient that billing each individual filing separately. It enables you to quickly generate an accepted filings report that probably contains all the information you need for billing your firm's eFilings. You can save this report in PDF or Microsoft Excel (csv) file formats. View a sample PDF report here. This report provides you greater control over what data is contained on your report of accepted filings for your firm. It takes more time to generate as you need to select which data fields you wish to have displayed. This report also enables you to be more selective of the data on which you wish to filter. You can save this report in PDF format. View a sample report here. 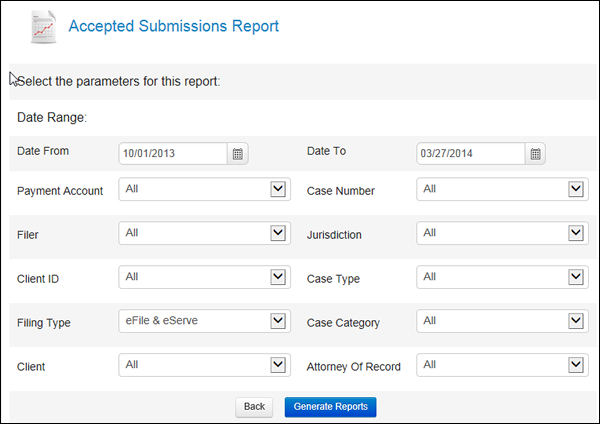 Use this report to bill each case individual filings rather that by submission if that is your desire. Most firms bill by submission. By using the appropriate filtering parameters you can create a wide range of reports such as all filings by all firm members during a specified time period. You can save this report in PDF or Microsoft Excel® (csv) format. View a sample PDF report here. 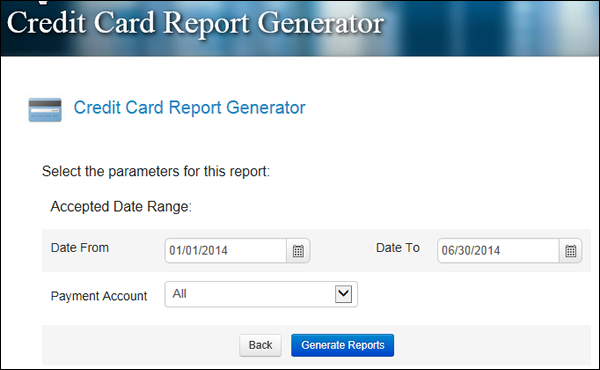 The General Report Generator creates reports based on almost any criteria available from our database. 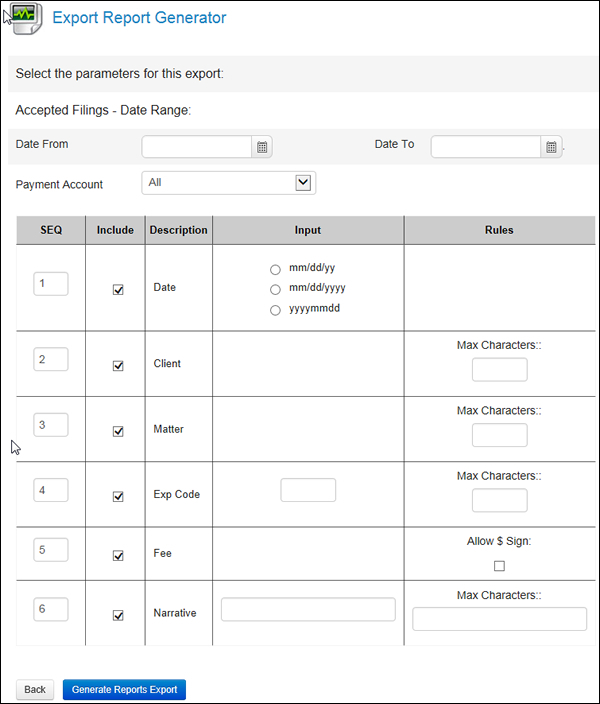 It also enables you to choose which data to display on the report. You can filter by any of the criteria shown in the middle column. 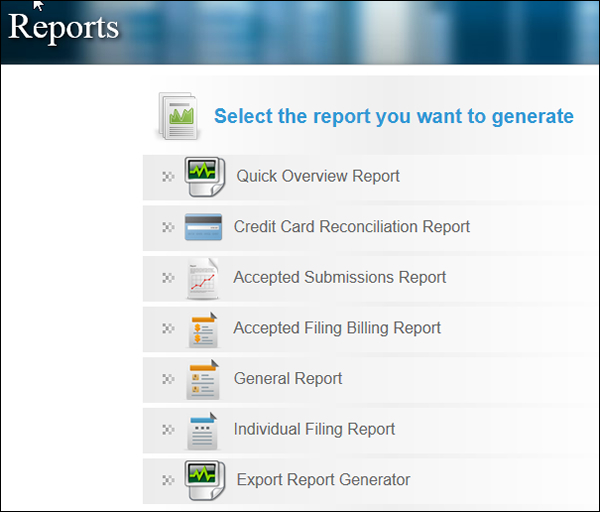 You can also design the report by selecting under Customize the Report which columns to display on your report. We recommend that you select no more than six or seven columns to provide enough column width for the columns you choose to view. You can save this export this report to PDF or Microsoft Excel® (csv) format. 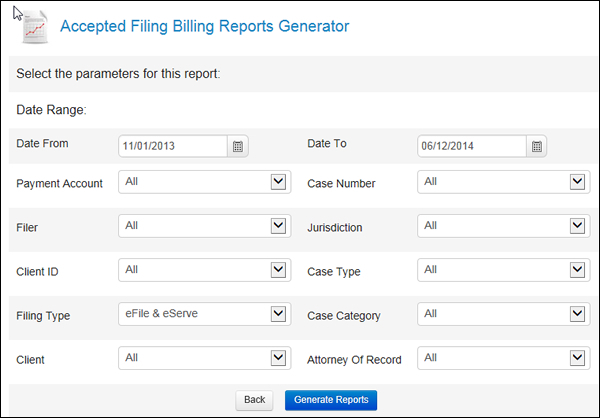 Use this generate a separate, detailed, one-page report on each filing matching your filtering criteria. 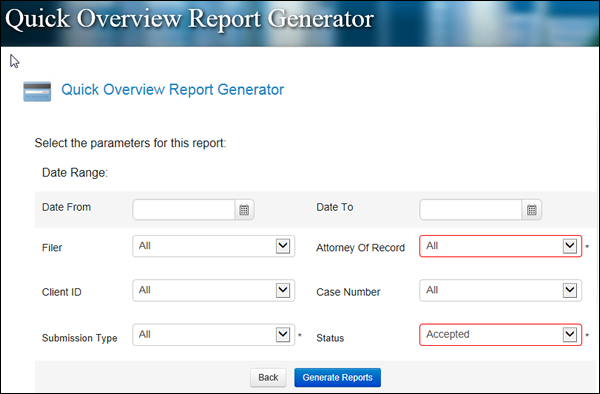 Use this feature to generate a report that you can save as a CSV file for importing the data into your firm's case management system. Include - Uncheck the check box in this column to exclude the data in that row in your report. Exp Code – Enter the Expense code used in your case management system for billing eFilings. Rules – This column enables you to define any data issues for the data for the row. Set the maximum number of characters for specific data row if your case management system limits the number of characters for that data. Select whether we should parse out $ for the Fees data as it is exported to the report. View a sample of the exported report here.